7 comments : Labels: Feelings / Emotions , Life and Love , Road to My Wedding! , This is Happiness! I think most (typical) men don't really know how a wedding would be like. What are the customs, the steps/stages or the traditions like... Especially when the Malays' wedding are quite steeped in age-old tradition with all the steps, rules, customs/traditions and what not. 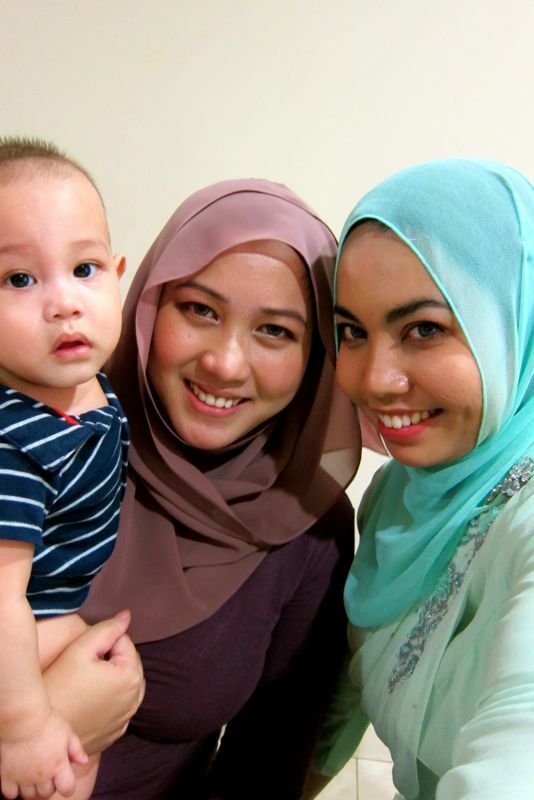 Well, like most men in Malaysia, or maybe in this world...my man is no exception. He is the typical, clueless man who doesn't really know anything about a wedding except for saying those 3 words, "Aku terima nikahnya...... blablabla", because apparently, that is the ultimate role on his part, when it comes to weddings, or so he thought. Pffft. 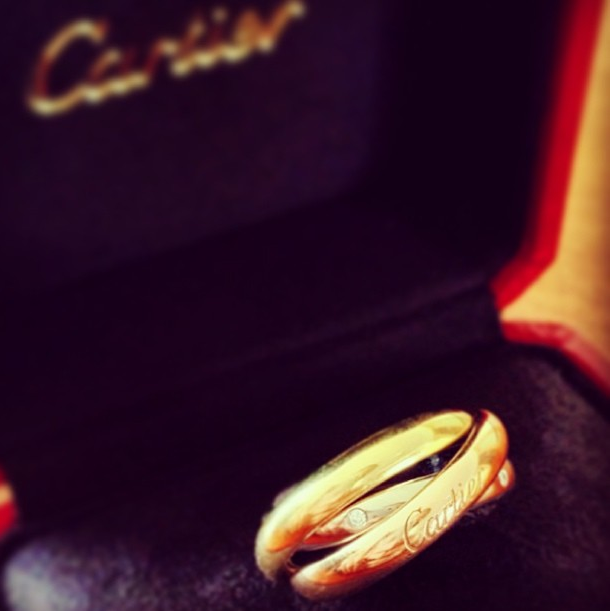 I didn't know about this until recently when we decided to get married. I mean I thought he'd have some tiny bit of ideas about a wedding (so my work would be easier?) since he is the last one in his family to get married - he got 2 elder brothers who already married, and a sister who is on her way to tie the knot as well, for God's sake? Hence, I really thought he would have some ideas installed in his head of what a wedding would be like, other than knowing only those lines! haha. But boy..I was wrong. My man have zero knowledge on weddings apparently...that has led us to some misunderstandings last time. (Already solved everything, by the way! Thank God! haha) Yes we fought few months back when we were just starting to plan to get married... However, the fight/argument that we had turn out to be SO funny now when I think about it! xD I really didn't know the man that I thought who were so "manly"...could turn out to be a "Groomzilla"??! Hahahah. Thaaat never occur to my wildest imagination! (Will get to that groomzilla part later. teehee. 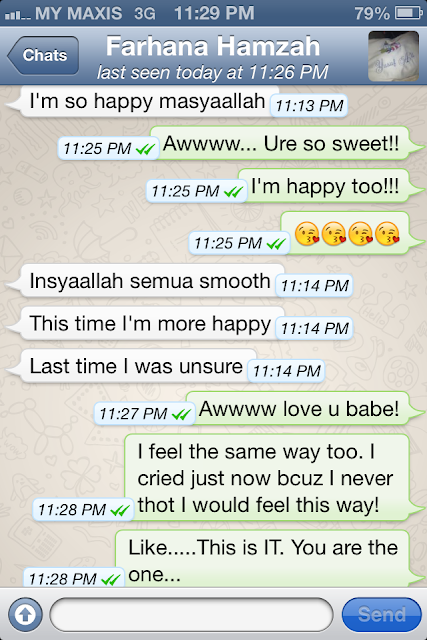 P/s: I love you baby! LOL ;p). He didn't even know what "Merisik" actually is! And I guess if it wasn't because of some of his friends who were already engaged last time, I think he wouldn't even know what "Bertunang" really is for! hehehe. Sabar je lah akuuuu...huhu. Anyway...I love watching The Notebook kind of movies, while he fancies a movie that has something to do with Batman or Spiderman or Superman or even Cicakman or maybe..Transformers or whatever movies that involved guns, blood, and some wrestlings. - So yeah, like most men on this planet, he didn't give a damn about what color matches with what...or what theme would be perfect for a certain event..or what's the difference between peonies and ranunculus flowers or whatever it is that has to do with weddings! Plus, he only have 2 or 3 of his close friends who just got married...and men being men, they don't really talk about weddings among them. They'd be like "Oh, that's so gayyyy". And the only thing that would pop in their mind to talk with each other regarding a "wedding", would be about the first night. Pffffffffftttt. And later, the ones who would be stressing out lebih-lebih to explain each and every details of the event to them then, would be us girls! (Read: me) Sigh. Men are so........ ignorant, huh? Heeesh. "So...what's the difference between Merisik and Bertunang?" "How long should we get engaged? Is there a specific timeline that is set by the traditions or something?" "What's the real meaning behind Merisik? Why do we need to do it?" 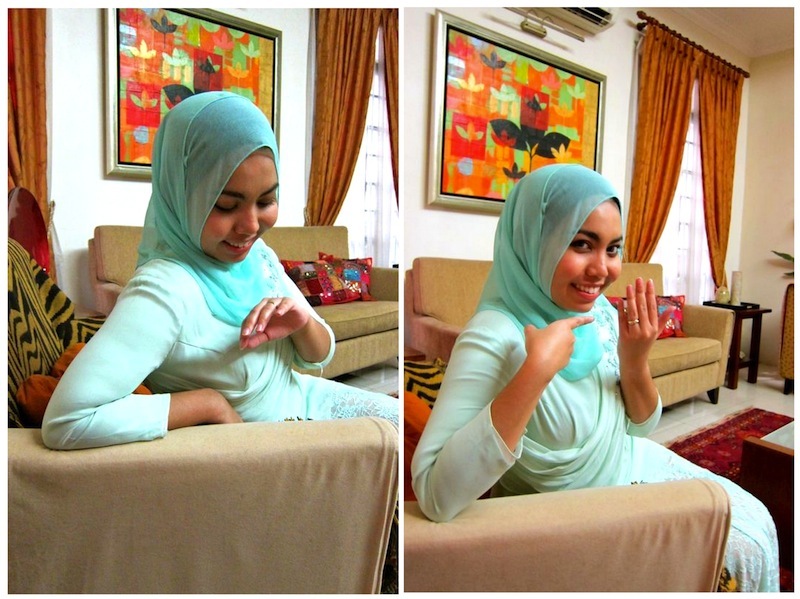 "So if I propose to you, do we still need to do the Majlis Bertunang?" "What's the difference between a Reception, Bertandang and Bersanding lah?" "Is there any separate Majlis for the Bertunang or Akad, like for girl side and guy side thing.. just like the reception?" "Do I need to bring anything to the Merisik thingy?" "How many events all together? Who would bear the cost?" "How many rings should I prepare for you?" "What's a sirih for lah??" 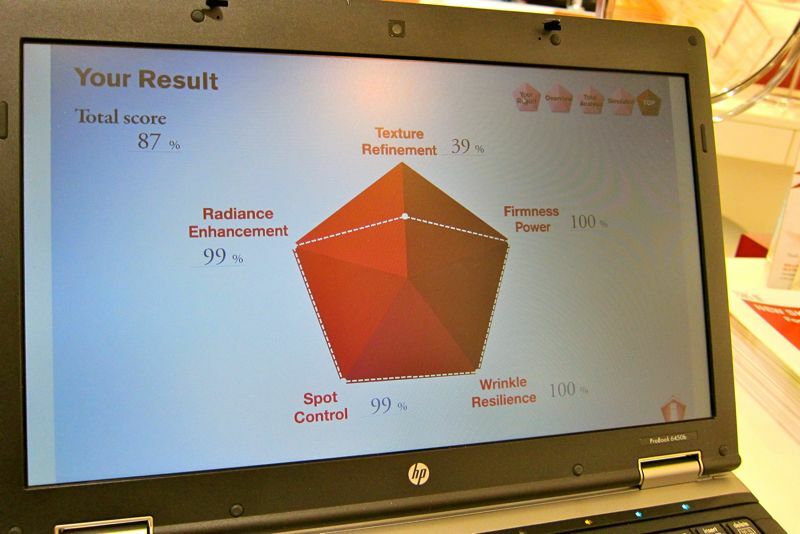 First we got the Adat Merisik, which is the "getting to know you better" stage. The Adat Merisik is actually a ‘seeking ceremony’ or ‘spying custom’. 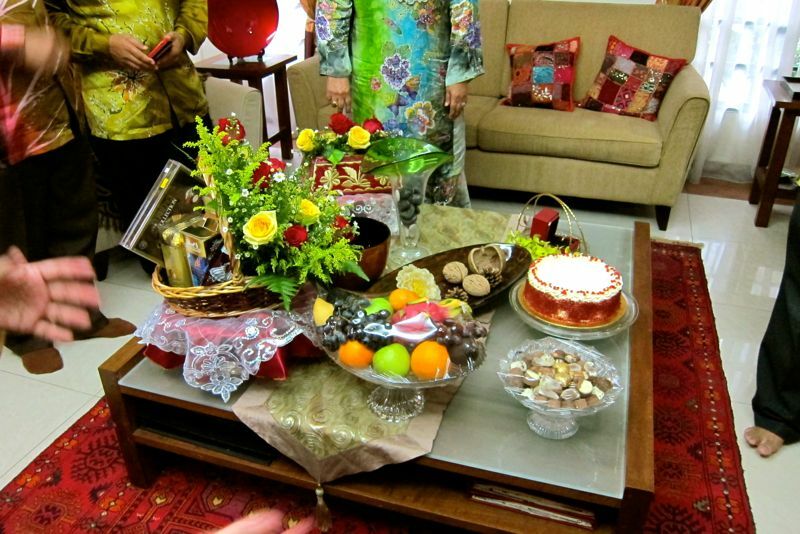 This traditional Malay system is crucial for arranging marriages. When a man is finally ready to settle down with the girl of his dreams (or in some cases his parents will find a suitable potential bride for him), his family will carry out the responsibility of seeking out information about that particular woman. During this stage, one or more representatives from the man’s family will pay a visit to the woman’s family. The merisik is not considered a formal proposal yet, and there may or may not be further arrangement of marriage. It all depends on both sides of the family. For me, the Adat Merisik is more like to familiarize and get to know who/what/which/how is the family of both sides, and gain the relationship/friendship between them. Then comes the Majlis Bertunang, a.k.a The Engagement between the two lovebirds. This is where we consider it as a formal proposal - When a marriage plan is being agreed by both parties, an engagement date will be set. 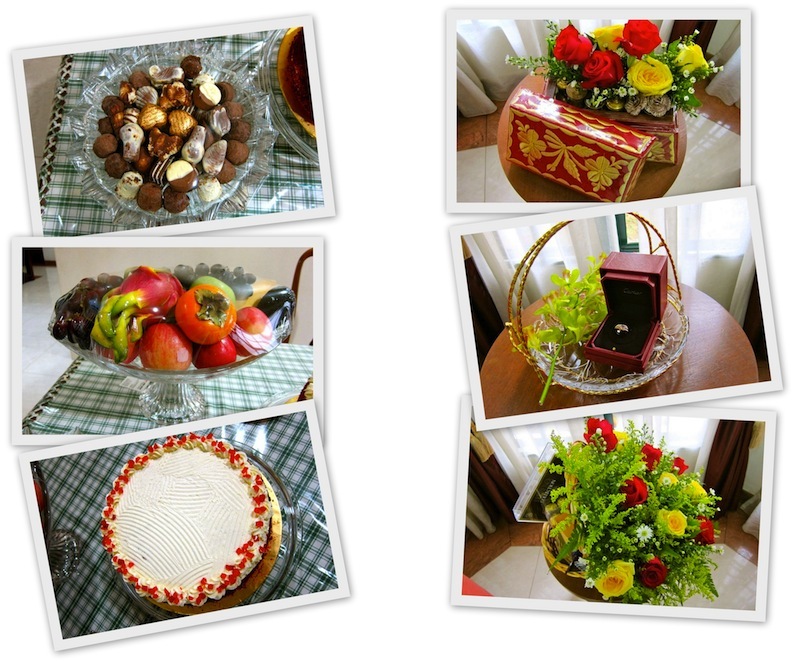 The engagement custom is usually held at the bride’s home. But these days, a lot of people have started to host it outside. The Majlis Bertunang/Engagement is being done as a symbol that the future groom and bride have already been reserved, and will get married soon, God-willing. Then the next step would be the Majlis Akad Nikah, where the real and actual wedding day would be held. 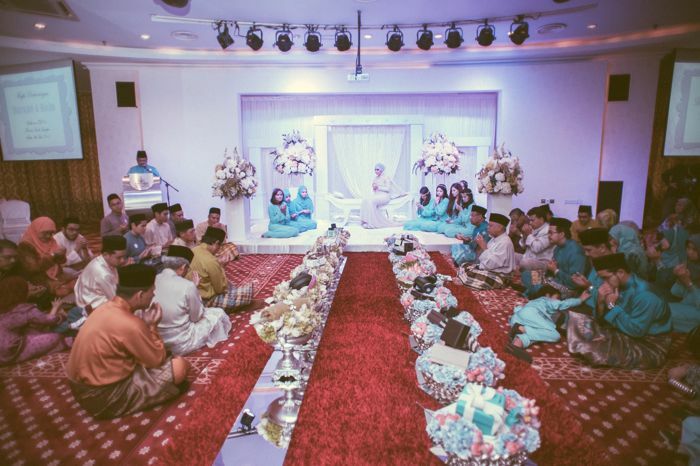 Akad nikah is usually conducted at a mosque or at the bride's home although these days, a lot of brides have chosen to do it at a hotel or banquet hall or something. 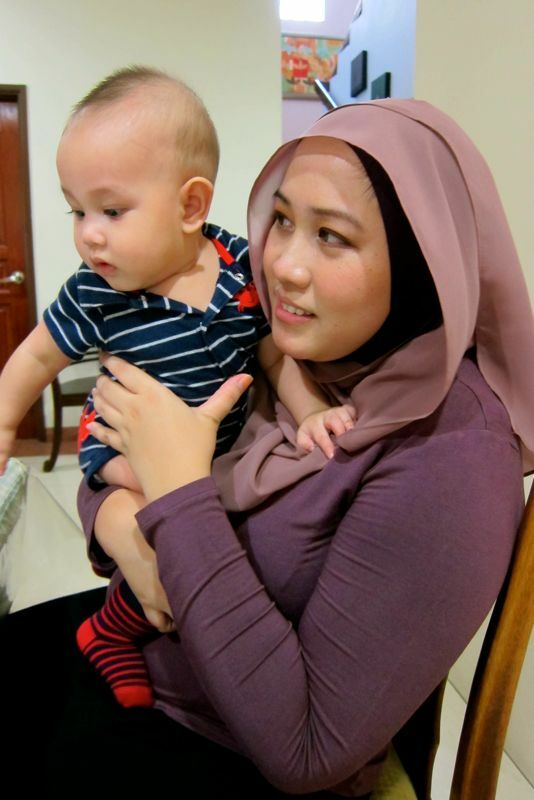 Akad Nikah is the moment when the wedding is being legalized in a religious manner, while bersanding is a family celebration, after the akad nikah. So during the event, the groom will sign the marriage contract and provide his bride with a Mas Kahwin/Mahar (some kind of a payment in the form of money, gold or any other thing as requested by the bride). So after explaining something like the above loooong story, I said to him... "So if you count all the events/ceremonies that I just mentioned, there are 5 stages all together, or in our case..it'll be a little bit more. And guess what? 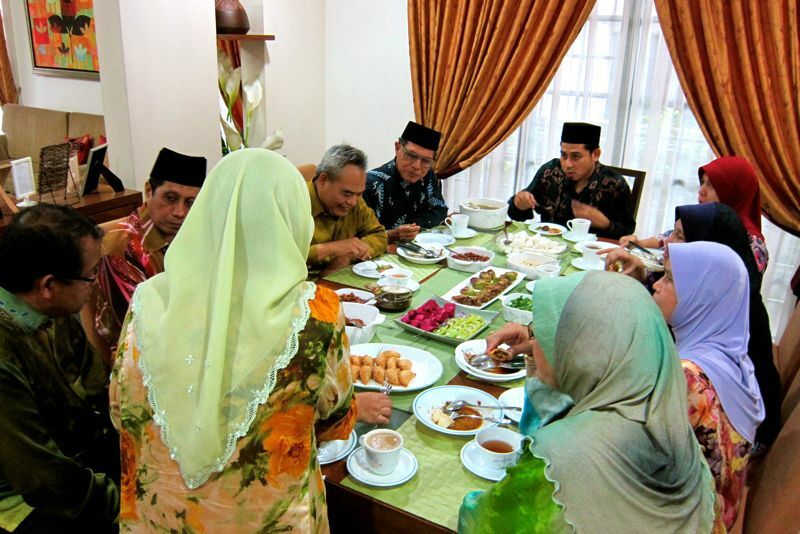 The first 4 stages of the ceremonies, which is the Merisik, Bertunang, Akad Nikah and Bersanding, would all be covered by the girl's family normally. The guy only gonna bear the cost for his Majlis Bertandang, which is the last step. 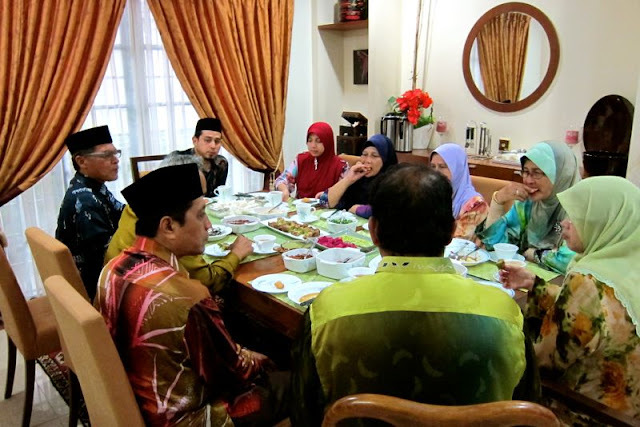 As for the other 4 majlis, you and your family, would only come as a "guest", not as a host. So because the girl's side is going to pick up the cheque more for the caterer, for the venue, for the dress, for the photographers, etc etc , thus you gonna have to be such a sweetie and let me have it my way! hahaha. Oh, and you definitely should love me more and moreeeeee for the rest of your life...and also, you gonna let me have my dress, and this shoes, and my this, and my that! hahaha. Okayyy, darlin?? ;p"
He replied, "Ok sweetie. You can have that shoes, just as long as you don't ask me to plan our wedding. I still don't know anything after what you explained. Cuz it's kinda hard to process in my head right now with all the weird rules and regulations and whatnot. I just wanna get married to you so I can concentrate on my work more after this. Can you continue later? I gotta go now, my work is more important than our wedding. Cuz if I don't do my work, I can't get married with the love of my life now.. alright? Let me know what have you planned for us later, ok honey? And show me your shoes. I wanna see and try to understand what's so special that you can't sleep thinking about it last night. Ok, bye sayang"
Penat explain panjang lebar...they don't really listen, do they, when it comes to flowers, cards, handbags, shoes, dresses, cakes, pelamin, hantaran, etc?? Fineeeeee. "Men are from Mars, women are from Venus", huh? 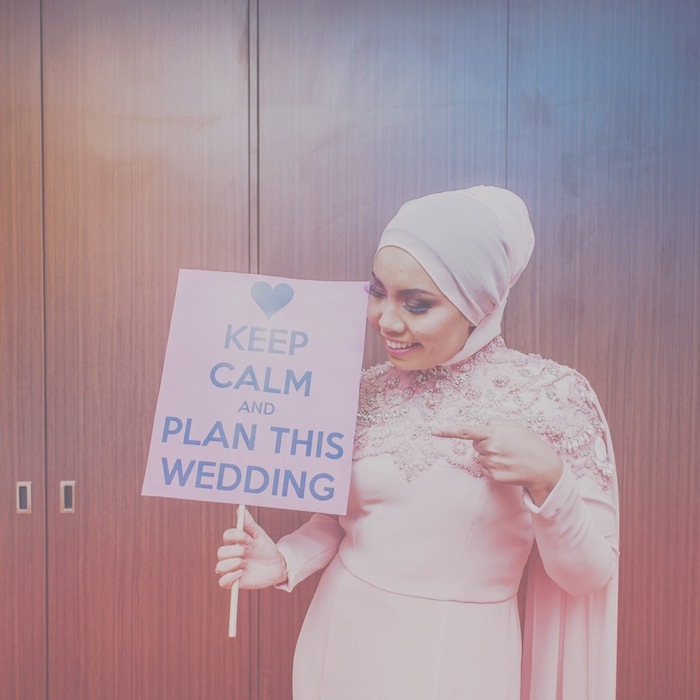 I will try to accept that during this whole wedding preparations, and redha that men don't really give a damn about weddings, and that I have to do this alone and on my own, and trust my own opinions. Oh, sad. Okthanksbye. Girly girl who is in love with her straight, clueless, but sweetie man. 11 comments : Labels: Man VS Woman , Road to My Wedding! As of now, the wedding preparation is 70% done, I think? Just gotta select the dress maker/designers, the make up artist, the henna artist, the door gifts, the invitation cards.. and hurm, what else? Ah, I can't really think right now. But I think I've covered most of it already. Just some little details je lagi..
4 comments : Labels: Life and Love , Saturday Romance , This is Happiness! My pimples were so bad and my period was irregular too. My hormones were unstable I suppose. 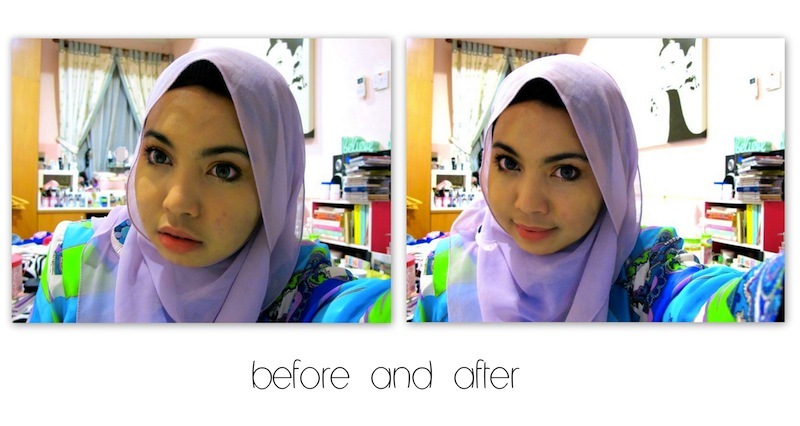 In just one month time, my face become from that clear, acne-free skin...to really bad severe acne on my face! :( It was SO bad that I always locked myself up in the room, not wanting to go out and face people! I had to cancel events, cancel going here and there, cancel appointments, cancel doing what I'm supposed to do, etc. Just because I just want to avoid seeing people. I even tried to avoid seeing my own family! Always locked myself up in my room! Yes...it was thaaaaat bad! I was always moody and sad. To be honest, I was so depressed. So anyways, like all the dermatologists/skin doctors in the world, I was forbidden from wearing any make up while I'm on the treatment. Except for mineral make up, as I was told by my very own skin specialist. Of course I knew that. 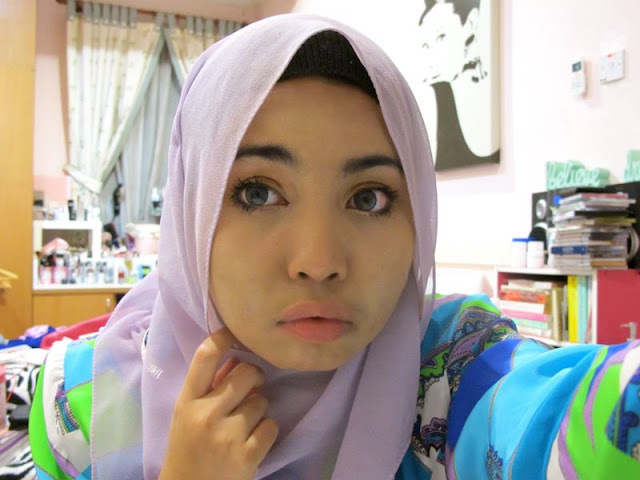 I knew make up is not really good for the skin. I don't even like depending on make up too, actually. But since we're living in the world where some people would judge you based on how you look, sometimes you need those extra help to cover your imperfections! Not because you wanna be fake or be/look like someone else or anything like that. But because you just wanna look and feel good about yourself, so you can have a little confidence and be happy with life. 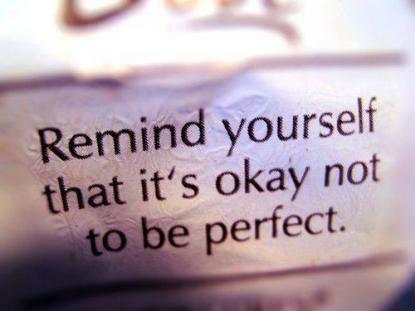 Especially for people that is not perfect like me.. 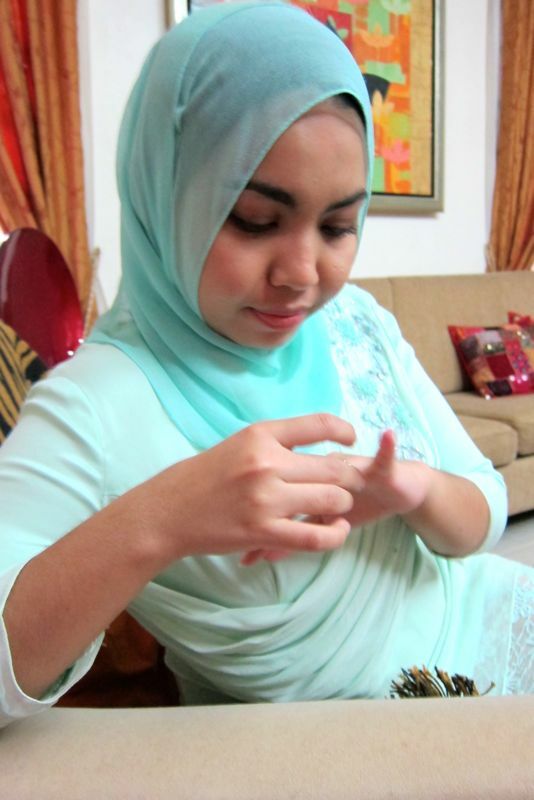 Anyway, the picture below is my recent Raya picture. You see those red spots on my cheeks? This is after 2 months of treatment from my doctor...the acne bumps isn't really showing up here, thanks to the antibiotics and steroids pills I took. But I do still have some red marks/acne marks that is quite hard to cover even with my make up! 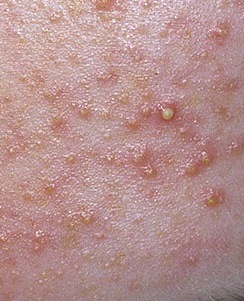 - Will share my meds and topical products for my acne in another post. And I gotta say, I put quite a lot of powder there to cover them...but they still show up! So imagine if I don't have any make up on to cover them?! Imagine how red my face actually is! For some, wearing make up might mean that you're being fake as you're not exposing the real you...or worse, some narrow minded people would think that wearing make up means you're an attention seeker and calling them vain and give them names or whatsoever it is that they try to put you down, when really..it's just a resentful cover for their own ineptitude and lack of action to make themselves look better. Pffft - Maybe yes, if it's too much. And yes I have to agree, that there are some women who wear makeup which also happen to be vain and attention-seeking, but that's a really different story altogether. I'm talking about those women who complain about how they look, but yet do nothing about it! And worse, trying to put others down who look good, just to make themselves feel better. Sigh.... What is wrong with the world laa.. huhu. Anyhow, I just don't see anything wrong with wearing make up, if you just wanna have a little confidence by enhancing the way you look! Like for me, in this case...wearing make up is like my shield, my savior and my protector.. from those cruel people who judged me based on my flaws.. I never really appreciate make up until I got this test from God. I know it's bad for the skin but...I really can't help it. I need to hide them whenever I meet anyone. Yesss...anyone! Even mom, or dad..or even Mr. Fiance - although they already seen the real bumps and redness.. haha. And although my fiance actually didn't mind at all and always say that he loves me for who I am, not because of my look or anything - But I still didn't believe him as I think he just wanna make me feel good about myself (cuz he's a darling like that), and I'm a worrier who worries about anything and everything. haha. - So I just didn't feel comfortable to let myself out there...to anyyyy one especially to the ones I love/who knows me. The feelings of looking into your beloved eyes, and knowing that they say things like "..your face has changed a lot. Poor you" in their thoughts and in their mind, is a bit melancholy and depressing for me. So yes, wearing make up is the answer for me when I'm going out to meet people! Otherwise, just stay at home/your room and slap on some colored acne cream that would stay on the skin (I don't like the absorbed kind! 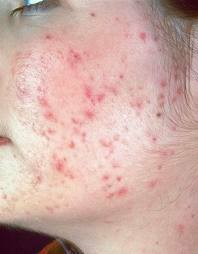 ), so the mom won't be so worried and nag at me when looking at my horrible inflamed skin! 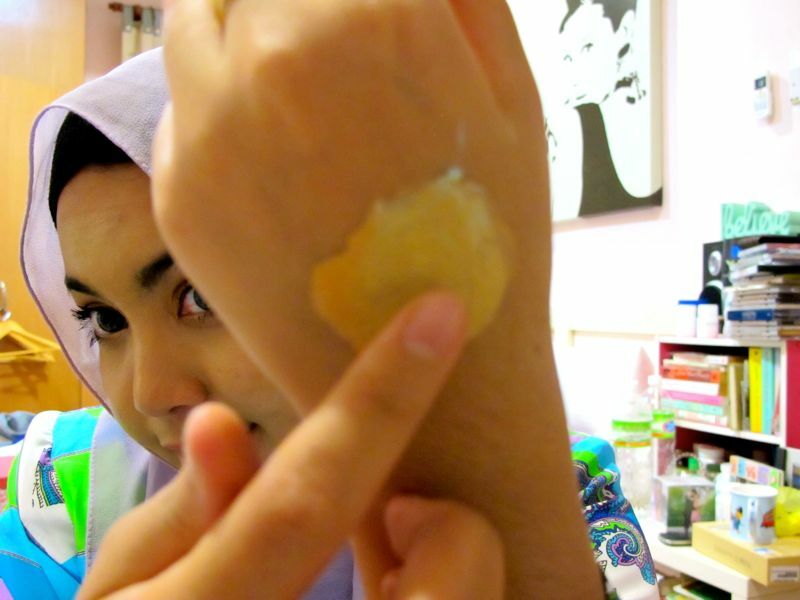 Oh gosh..I have typed quite long already regarding my acne story. Hee..I just realized this! ;p Now I want to share with you; the acne sufferers, who want to look good and gain back your confidence..even if it's just temporary! 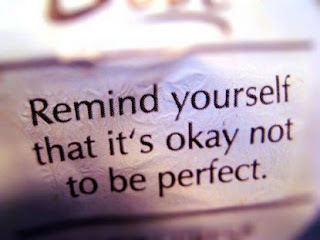 Yes, there is still hope..although it's not a permanent solution, but this is how I do to hide my imperfections! - Hey...at least there's a way to minimize our misery, right?! hehe. I know as we're in the midst of healing our skin, we're not supposed to do this often. So what I'm about to share with you now is for you to do it on emergency days. OK? But for those who is not really an acne sufferer/undergoing treatment like me, but has some little imperfections that you wanna correct, this trick would do just fine for you! Be it freckles, redness, moles, dark circles, etc! Remember those days when we were in art class in school, our teacher used to teach us what are the primary colors and which color to mix with what color to get a certain color? Remember those days? Now...try to apply that on your red face! - Green is made up of two primary colors; blue and yellow. While red and blue mixed together gives you purple. Yellow added to purple gives you BROWN - or light brown/beige in this case when you mix a green concealer with a beige/yellow concealer, which is the kind of tone you're looking for when you're concealing your redness on your skin! Corrective color palette basically follow the simple rule of ‘neutralizing’ an opposite color on the skin and then hiding it to match the respective skin tone just as in a Color Wheel where we learn last time in school...to get to where the color opposite to a particular shade that neutralizes it! These concealers usually come in various colors ranging from the natural skin tone color to colors like green and purple. A color like yellow/beige helps to tone down and even out the skin tone. However, it does not ‘hide’ anything specifically which is why we need other colors to do the hiding work! Like purple or green for example! So apart from the natural skin tone color concealers, the colors available in the cosmetics market are: White, Beige, Yellow, Orange, Mint Green, Light Green, Lavender Purple, Mauve, Light Blue, Pink and Light Peach. My personal favourite to do the hiding work would be the green and the purple one! White: Used with Beige to cover up heavy under eye dark circles. 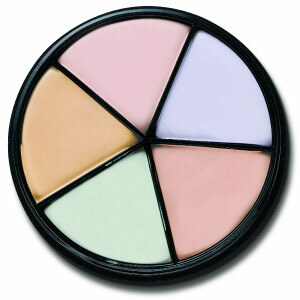 Beige: Used to conceal slight shadows and brighten up the complexion and under eye area. Used with White to conceal heavy under eye dark circles and around the nose area to conceal slight shadows. Yellow and Orange: Neutralizes redness and brown discoloration. Used to conceal red blemishes, bruises and tone down any redness on the face near the nose, lip area, cheeks etc and on brown spots. 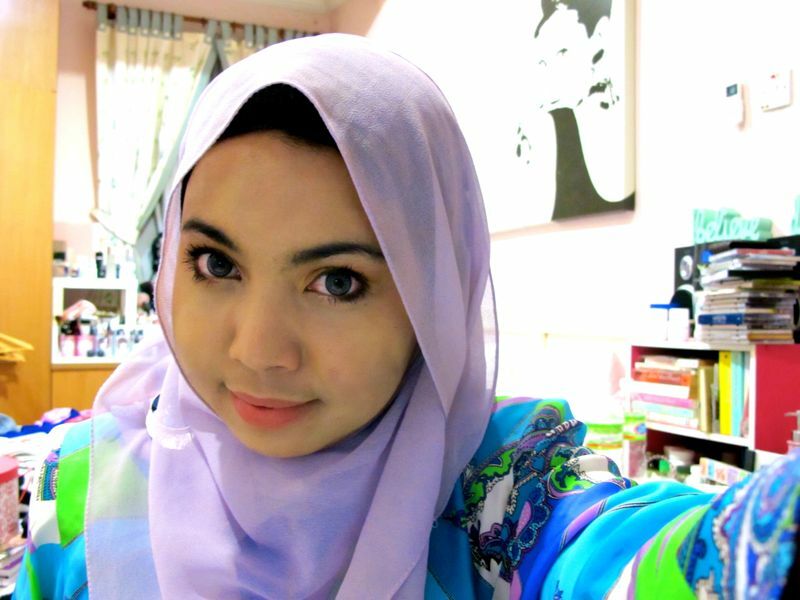 Orange helps to neutralize the blue toned under eye dark circles and purple bruises. Mint/Light Green: Neutralizes redness as well. If the redness is too dark, mint/light green is used with/without yellow to neutralize it. Works the same as the Yellow concealer except only on darker red spots and scars. Lavender Purple: Used to neutralize yellow-colored bruises or imperfections, yellow under eye or cheek area due to an illness/flu etc on bronze-olive skin tones. Mauve: Used to cover up dark/black spots and visible veins on the face. Light Blue: Used to neutralize orange spots, tan lines/spots, age spots and freckles. Pink: Used to conceal dark gray shadows just below puffy under eye dark circle area and and shadows around the nose. 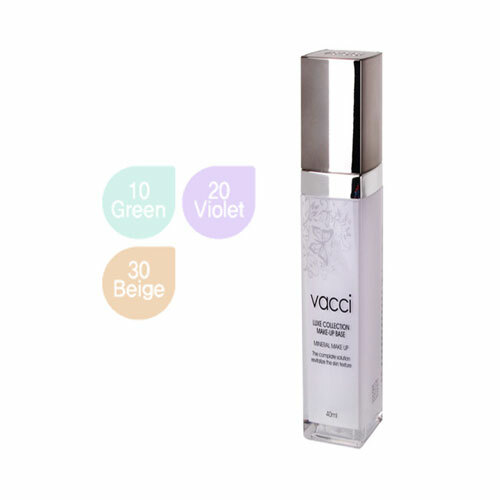 Light Peach: Used to brighten up olive skin tones and balance out slight color discolorations. Can be used for slight coverage of blue veins. 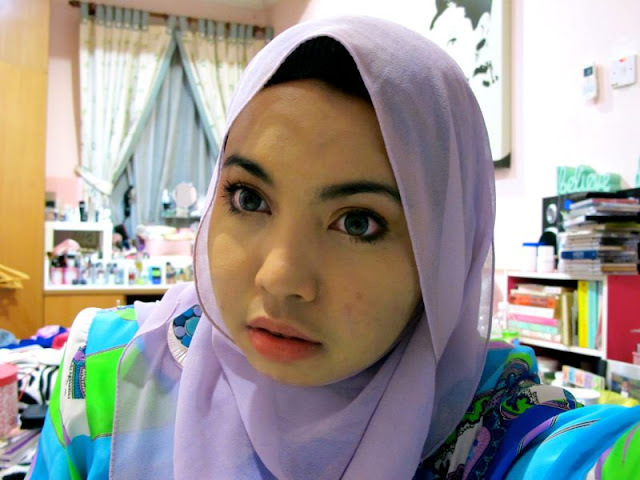 So for this Raya...I hide my redness and inflamed skin with some mineral make up. My doctor said, if I really have to wear make up while under her treatment, she suggested me to wear a mineral make up at least. And so I did! So this is what I used. 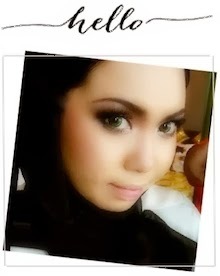 All mineral-base make up.. So how do I wear it? 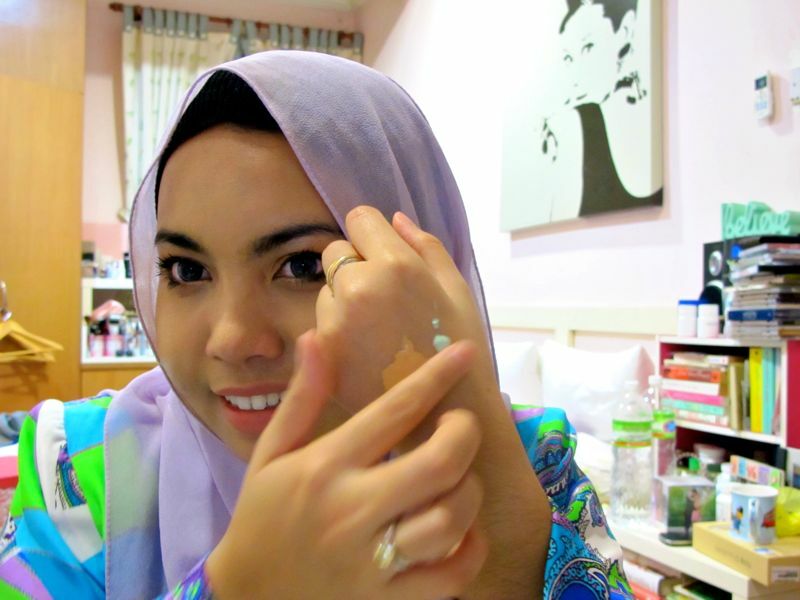 I pumped my beige foundation and my green liquid make up base side by side onto my hand...and I mix them up! I like to put my concealer on my hand first rather than applying it straight to my face...so I can figure out how much liquid I actually need on my face, so I won't overdo it. Mix until you get your perfect color that can hide your redness! 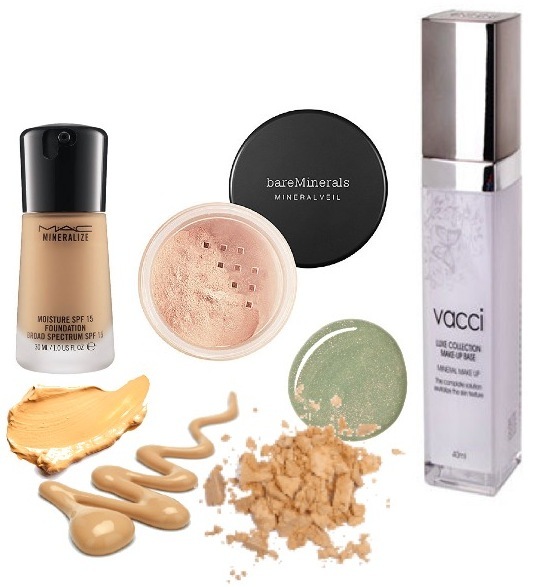 Just like working with a normal concealer, after applying the corrective concealer on the spots, set it with powder.. Check whether you have blend the color well or if you need to add more..
Now..get yourself the three major colors you need to have on your make up table. You never know when you might need it! You can purchase it here! NOTE: Under eye dark circles come under blue, purple and brownish tones.. therefore they are neutralized by yellow or beige. Hope this helps you ladies out there who are struggling with concealing those tough under eye dark circles and red blemish/scar marks.